The fireweed is in full bloom here in Juneau, a sign that summer will soon end and fall will begin. 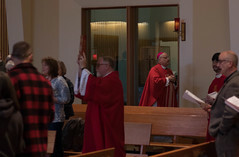 As I think of endings and beginnings, a new Oblate priest, Father Dwight Hoeberechts, O.M.I., has been missioned to our diocese. Fr. Dwight is the new pastor of Saint Gregory Nazianzen parish in Sitka. He joins Father Patrick Casey, O.M.I., the pastor of the Cathedral parish, as the two Missionary Oblates of Mary Immaculate serving our diocese. Father Andy Sensenig, O.M.I., who, having served for four years as the pastor of St. Gregory’s (and earlier in Soldotna in the Archdiocese of Anchorage) has received a new assignment in Texas. He is the director of the Lebh Shomea House of Prayer outside of Sarita, Texas. This retreat house of the Missionary Oblates of Mary Immaculate provides Oblates and others with the opportunity to deepen their relationship with Christ in a contemplative setting of silence, solitude and prayer. I am grateful for these priests generously serving the people of God, and to the Missionary Oblates of Mary Immaculate. The Oblates have been providing us with priests in this diocese for many years. We are also blessed by the Korean Missionary Society for their recent missioning of Father Augustine Minn, K.M.S. 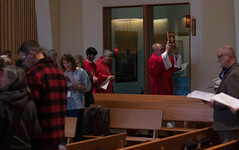 Father Augustine is the parochial vicar of Saint Paul the Apostle parish in Juneau. Please remember to pray in gratitude for the Oblates and the Korean Missionaries and especially for an increase of vocations to their communities. I was very sorry to learn of the unexpected deaths of Dan Austin, the General Manager of the Society of St. Vincent de Paul in Juneau for over 20 years, and Sid Heidersdorf, the longtime leader of Alaskans for Life. Both men’s lives exemplified what it means to encounter and serve our Lord Jesus in persons who are poor and the most vulnerable in society, especially the unborn. We offer our prayers for them and their families. May they rest in peace. The keynote speaker, Dr. Susan Timoney, Professor of Pastoral Studies at Catholic University in Washington, D.C., has an Alaskan connection as she was a Jesuit Volunteer in Tanana and Fairbanks in the 1980’s. I’m pleased to welcome all of our presenters and our guest pastoral musician, Father Ricky Manalo, C.S.P. He is a well-known Paulist priest and liturgical composer. You are cordially invited to attend this important conference. You will find more information about the conference and how to register towards the back of this paper. In the beginning of September, I head to Rome to attend the new bishop’s workshop. It has been a little over a year since I was appointed your bishop by the Holy Father and 10 months since my ordination. Hopefully, having gained some experience as a bishop during this time will help me to get the most from this education and formation experience. The highlight will be meeting Pope Francis. You can be assured that I will ask him for his blessing on us all. Bishop Andrew E. Bellisario, C.M.